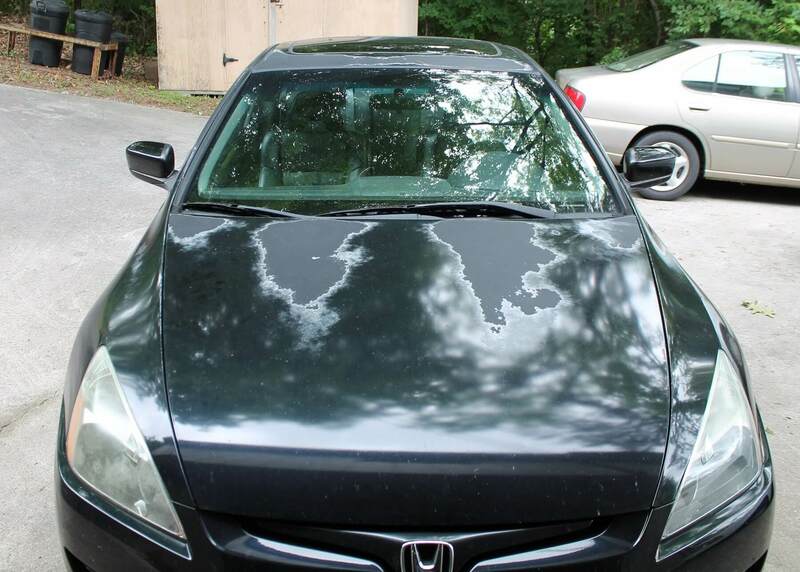 →How does the sun damage black car paint? You might be wondering why your once radiant car paint fades away after some years of exposure to the sun. Interestingly, the same sunshine component that causes your skin to age, that is Ultraviolet Rays (UV), is majorly the same energy that degrades the auto finish. When the invisible but powerful UV light contacts any surface, it jolts up the object’s molecular energy. Some of the additional energy is released as heat while some of it ends up breaking some of the object’s molecular bonds. With time, when a substantial number of molecules are affected, your motty will no longer respond to light as it used to. It reflects less light and thus appears dull, giving off less outward light that we use to decipher color. Combine this with other nature’s elements such as dust, grime, road tar, tree sap and bird poop, the dull car is worsened by scratches, spots, and swirls. You start wondering why even after using the best wax for black cars with scratches, the vehicle’s radiant finish only lasts for a few days. Fading due to the sun varies with the wavelength of the vehicle’s paint color. The visible light is a spectrum of wavelengths and a material’s color is determined by the wavelengths absorbed and the wavelengths reflected. Paint of black color absorbs all the wavelengths, and thus fading is faster due to the higher energy absorbed. One of the ways of minimizing sun damage is always parking your car in the shade, under a tree, a carport or garage. The second care regimen is regularly washing and drying the car, to reduce dirt accumulation that creates scratches and swirls. After this, all you need is the best wax for black cars which reduces exposure to the sun’s UV rays and other environmental elements. Filming the car can provide the next protection level, and it involves coating to cover and protect the auto paint from the elements while at the same time allowing the color to shine through it. The filming products can either be a film layer or a liquid spray applied by pro detailers.